Distinguishing Characteristics: White female. Brown hair, hazel eyes. Brown may use the last names Oneal and/or O'Neil. She has a scar on her forehead and a scar near her right eye. Clothing/Jewelry Description: Numerous rings, including an Irish marriage ring, a filigree ring set with a diamond, a heart ring and a dolphin ring. Medical Conditions: Brown is an alcoholic. She broke her right foot prior to her disappearance and removed the cast herself shortly before she vanished. 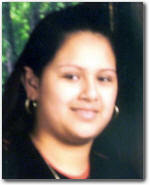 Brown was last seen walking away from her Hudson, Florida residence on January 16, 2000. She planned to walk to Sullivan's Bar nearby. She has never been heard from again. Brown frequented bars and worked as a bartender in 2000. She did not take any personal belongings with her. Her case opened 2018 by Psychic Brian Ladd.